Why do cats bury their poo? It’s probably not a subject that most people spend too long thinking about, but anyone who has noticed their cat carefully covering their deposits may wonder what is going on and why they seem so intent on doing a good job. After all, the same interest in covering up poo cannot be said for our canine companions! So why do cats bother? 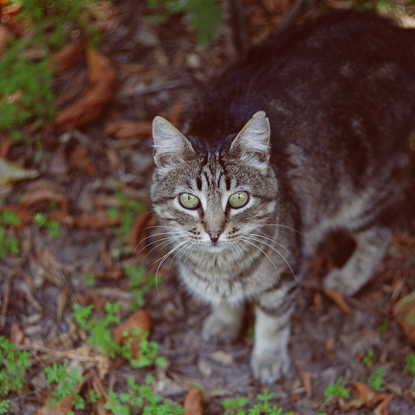 Many people think that burying poo is just one example of the ways in which cats are fastidious creatures and have a more delicate sensibility than other animals, somehow knowing that visible waste is something socially unacceptable. In fact, rather than it having anything to do with being offended or disgusted by their own waste, it is actually a hangover from the days when cats lived in the African Savannah and took up this activity in order to keep their whereabouts hidden. This meant that they could avoid detection from both sides of the food chain; it helped them to stay concealed from the bigger predators wanting a cat for dinner and the prey species the cats were trying to catch for their own dinner. It was simply a case of self-preservation! 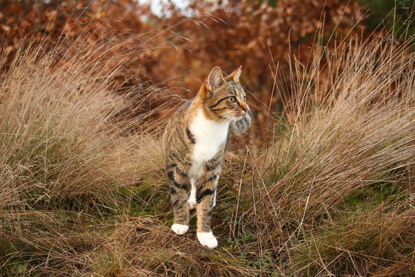 Another interesting fact about cats and their poo is that in the wild, cats steer clear of toileting near to areas in which they eat or drink to avoid contaminating their food and water. Our domestic cats still have this instinct and also prefer to toilet away from their food and water. They also understand that the act of toileting is when they are at their most vulnerable and so look for a safe and private location, in order to do their business, where they are less likely to be disturbed. So you see, even something as seemingly bizarre as poo burying, often has its root cause in history – another reason to familiarise ourselves with the history of the domestic cat. Go to www.cats.org.uk/cat-care/ufo-elearn to find out more. How can I tell if my cat is stressed?